In theory, the Heisman Trophy is annually awarded to a player that means the most to the success of his team. Routinely the award is given to the most important player on one of the best teams in college football. In 2009, Alabama’s Mark Ingram averaged 6.1 yards per carry on 271 carries. In comparison, West Virginia’s Noel Devine matched Ingram with 6.1 yards per carry on 241 carries. The very important difference between the two tailbacks is the fact that Alabama defeated Texas in the 2010 BCS Championship Game, while the Mountaineers lost to Florida State in the Gator Bowl. Possibly due to my location on the west coast, as the new season approaches all the Heisman hype pours over the play of Jake Locker, Jacquizz Rodgers, Kellen Moore, and LaMichael James. Is there a blindfold over my eyes, is my selective memory on cruise control? Devine is by far the most important player on his respected team, and could be considered one of the most consistent tailbacks in the nation over the past three years. In all logical terms he should be the front-runner to take home the Heisman come December. A Florida prep highlight reel, Devine chose to attend West Virginia after receiving a five-star rating by both Scout and Rivals recruiting services. The 5-8′, 176 pound athlete contributed as a freshman despite watching Pat White and Steve Slaton lead the team to the 2008 Fiesta Bowl. He finished the 2007 season with 627 yards rushing on 73 carries with an impressive 8.6 yards per carry average. Devine totaled 1,316 all-purpose yards as a freshman. Devine stepped into a starting role in 2008 as Slaton departed a year early for life in the NFL. He did not disappoint as he carried the ball 206 times for 1,289 yards, four touchdowns, at a clip of 6.2 yards per carry. The Mountaineer tailback posted five 100-yard games, and helped lead the team to a victory over North Carolina in the Meineke Car Care Bowl. Entering his junior season, Devine knew his role would increase with the departure of a iconic quarterback in White. He finished the 2009 season with 241 carries for 1,465 yards, 13 touchdowns and a 6.1 yards per carry average. Against Colorado in early October, he ran for 220 yards on 22 carries for an average of 10 yards per carry. The end of the season saw Devine ranked ninth nationally in rushing yards on the season. The Mountaineers are primed for a big year coming of a 9-4 season and coach Bill Stewart entering his third season. The defense is talented, experienced, and ranked 31st nationally in 2009 by allowing 21.9 points per game. West Virginia, along with Pittsburgh, and Cincinnati are expected to battle for the Big East title. The schedule provides a better notion into Devine’s strong Heisman chances. He will have the opportunity to run over the lackluster defenses of UNLV, Coastal Carolina, Maryland, Syracuse, Cincinnati, Louisville, and Marshall. The two most difficult games on the calendar are road games against LSU, and Pittsburgh. 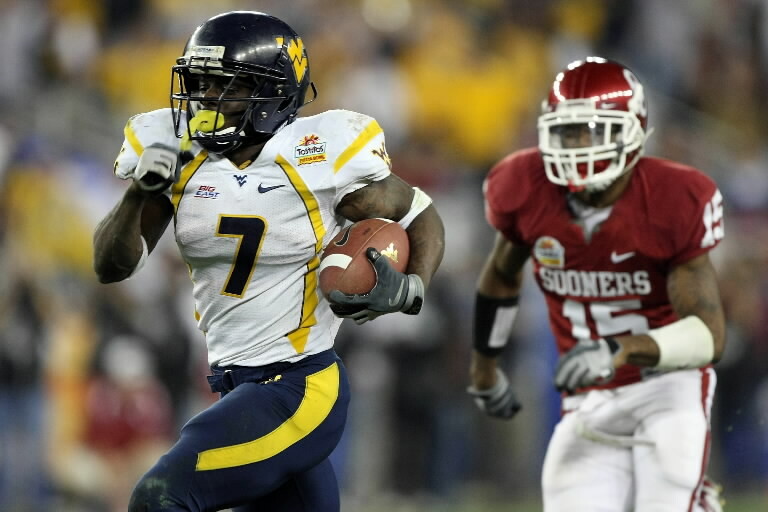 The Mountaineers have a great opportunity for a conference title, only one loss, and a BCS bowl berth. Stewart is breaking in a new quarterback and look for a larger load to be placed on the senior running back for much of the season. His carries will increase and don’t be surprised if he approaches 2,000 yards rushing on the season. Sure Ingram returns, but gone is Tim Tebow, Colt McCoy, Sam Bradford, and Jeremiah Masoli (somewhat). Here is a look at the other legitimate candidates, and what they have going against them. Mark Ingram, Alabama —The junior tailback has the benefit of playing on perhaps the best team in the nation. Ingram will lose a good amount of carries to a talented sophomore in Trent Richardson. One must go back to 1975 when Ohio State’s Archie Griffin was the last repeat winner of the Heisman Trophy. Jonathan Baldwin, Pittsburgh —The Panthers are also breaking in a new quarterback, which will directly effect Baldwin’s receiving statistics. The last two wide receivers to win the Heisman were Desmond Howard in 1991, and the hybrid Charles Woodson in 1997. Kellen Moore, Boise State —The Broncos must finish the regular season undefeated for Moore to stand a chance to win this prestigious award. Playing in the forgotten state of Idaho, and the WAC does not give Moore a great chance of garnering the media attention he needs to pull in the Heisman. LaMichael James, Oregon —Entering his sophomore season, the Texas native did out perform Devine in terms of rushing yards, touchdowns, and yards per carry in 2009. The Ducks are loaded with talent at running back and expect James’ rushing load to decrease in 2010. Jacquizz Rodgers, Oregon State —The Beaver running back has been nothing short of consistent and productive in his two years with the team. The non-conference schedule for the Beavers is daunting, and the team will need to win nine or ten games for Rodgers to be a legitimate Heisman candidate. Case Keenum, Houston —Much like Moore and Boise State, the competition Keenum will face in 2010 will not provide the respect needed to back his passing statistics. The Cougars will need to finish the regular season undefeated and his numbers will need to be off the charts. Jake Locker, Washington —A highly-touted NFL prospect, the play of Locker in Seattle has not been spectacular. The chance of the Huskies challenging for a conference title are slim, and many don’t even believe he is the best quarterback in the Pac-10. Here are the facts. Devine is lightning quick, explosive, and durable. He has never averaged below six yards per carry during a season. He is a senior, and has lived up to the five-star ranking given to him out of high school. He has a great chance to win the Heisman Trophy, Doak Walker Award, and being named a First Team All-American selection. ~ by philip d. on July 30, 2010. This entry was posted on July 30, 2010 at 12:52 pm and is filed under 2010 Predictions, Alabama Crimson Tide, BYU Cougars, NCAA Football, Ohio State Buckeyes, Oregon Ducks, Oregon State Beavers, Pitt Panthers, Polls, Washington Huskies, West Virginia Mountaineers.You can follow any responses to this entry through the RSS 2.0 feed.You can leave a response, or trackback from your own site.